U.S. Rep. Rosa DeLauro, 3rd District. Washington – Three years ago congressional veteran Rep. Rosa DeLauro felt compelled to do one of the few things she had never done before – write a book. 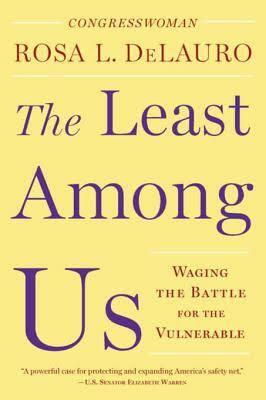 The result is “The Least Among Us: Waging the Battle for the Vulnerable,” a smooth read about her fight to protect the social safety net and her battles with both Republicans who tried to shrink key domestic programs like Medicaid and food stamps and Democrats who disagreed with her position or her approach. In pulling the curtain back on some of the messiest political battles during her 26 years in Congress, DeLauro’s book rings true about how Congress really works and deals are done. She also faithfully portrayed the personalities of political enemies and allies. An ambitious Democrat who worked her way up her party’s hierarchy, and battled the sexism that was rampant in Congress in her early years in office, DeLauro, 74, details both wins and defeats. But mostly it’s the wins, whether taking on former House Speaker Newt Gingrich and his “Contract with America,” or former President Obama on a proposed trade deal with Pacific Rim nations. She also lovingly describes the source of her passion for politics – immigrant Italian parents whose “New Deal” politics infused their work as aldermen in New Haven. Her parents might have been progressive, but DeLauro was never able to reconcile with her father after she broke with Italian tradition and left home as a single women in the 1960s. 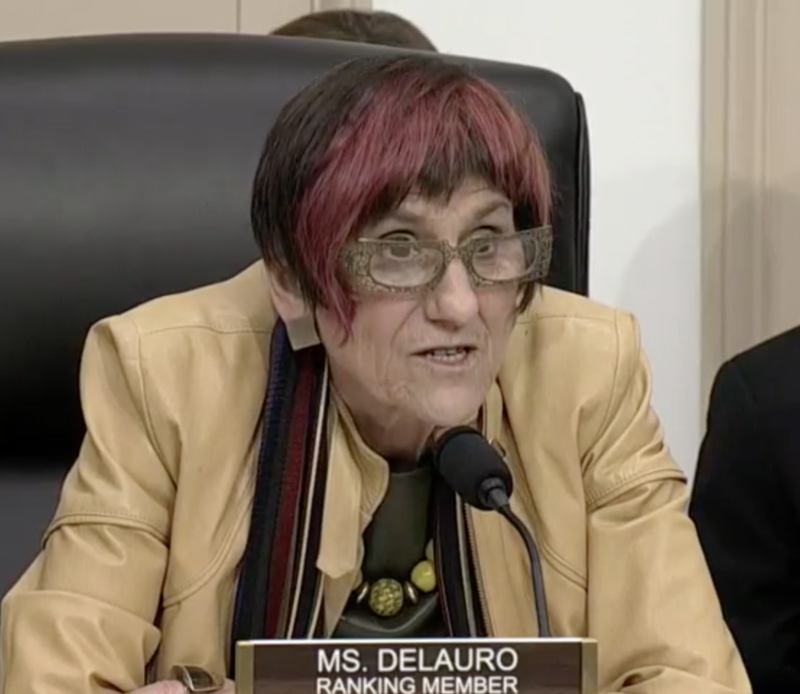 DeLauro also credits her Catholic upbringing for her values and recounts with pain the church’s rejection of her after she embraced the pro-choice cause. The Connecticut Mirror talked to the congresswoman about her book, which was released this month. I believe the social safety net represents a responsibility to one another. It’s a shared responsibility, if you will, a moral responsibility…That’s something I learned from my parents. They provided opportunities for people, and they made government work for people. And now when we look at the social safety net today, it is under the most massive assault. Your book is not only a defense of social programs like food stamps and the child tax credit, but also a history of how those programs were created in a bipartisan way…. Democrats and Republicans came together and said, ‘We have a serious problem in our nation, and we have to come to grips with it. We may have different approaches, but we are going to solve this problem.’ That’s how the social safety net was created. Then you get to Newt Gingrich, when you begin to see the attack on the social safety net. Then you had the Tea Party and now you have Donald Trump and Paul Ryan. And as I’ve said, it is under the most massive assault that we have seen. Are you confident you can protect these programs from this assault? I have been in this fight before. I’ve been in the fight against block granting food stamps and cutting Medicare. We had these fights before, and we beat them. I wanted to remind people of the importance of the safety net and how it has lifted millions out of poverty. But you say this is a time when the safety net is most vulnerable…. This is a much more massive assault on the safety net than you had seen with either Newt Gingrich or the Tea Party. First of all you have the repeal of the Affordable Care Act, which would take away people’s health care and is a vicious attack on Medicaid that would leave people with disabilities out in the cold … If you had pre-existing conditions you would no longer have coverage. And then you look at the president’s budget, and I don’t care where you look at the president’s budget. You’re looking at a $192 billion cut to the food stamp program, you’re looking at a $9.6 billion cut to education, child tax credits they are going to tamper with. And again, I lay out stories in the book on how we won those battles and we were able to strengthen and expand and strengthen some of these programs. And now the big fight will be over Medicaid. Quite frankly it’s Paul Ryan’s dream to try to do away with the Medicaid program as we know it. They feel that they have a moment with the House and the Senate and the presidency. And you think there’s a chance to stop GOP efforts to replace and repeal the Affordable Care Act? I believe we can. Look at the health care bill. First of all the first go-round Paul Ryan had to go to the president and say, ‘We don’t have the votes.’ It was because Republicans and Democrats said no. When they came back a second time and they passed it by two votes, the fact of the matter is it wasn’t about health care, it was about cobbling a vote together to say ‘the House has repealed the Affordable Care Act.’ Look at the Senate this past week. This isn’t about members of Congress. This is about a public outcry, this is about mobilizing. So you are optimistic you can stop the repeal of the Affordable Care Act? What feeds your passion for the fight? How do you keep going? Because we do have the opportunity to win. We have done that in the past and we will be able to increase opportunity. When you get a Sen. (Lisa) Murkowski and a Sen. (Susan) Collins on the floor of the Senate say they voted against Betsy DeVos as secretary of education, that’s because they heard from thousands and thousands of people. I believe there is a great strength out there, and it’s being played out, in both the House side and the Senate side, on the health care bill. And I think people are going to keep up that momentum in the next two or three weeks. Is there a Democratic Tea Party now? I think the country has mobilized. I credit that not to members of Congress, but to people who have understood. A lot of people were opposed to [the ACA] in the past. But rhetoric has turned into reality that you are now covered if you have a pre-existing [health] condition, your kid can stay on your policy now until he’s 26, that you have the benefit of not having to pay for preventive services. That’s all kicked in. It’s not the Congress that’s turning this around. It’s the public that’s turning this around. The other interesting thing is that a lot of people have come out of the woodwork, especially women, who want to run for office. And that’s good. Does this have to do with Trump, that people are paying more attention? Creative commons photo by AGFE. 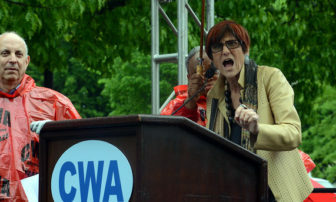 U.S. Rep. Rosa DeLauro, D-3rd District, speaks against the Trans Pacific Partnership fast track bill at a rally held by organized labor. Folks who’ve came to this Congress before understood why they came to Congress. They understood this was an institution to provide opportunity for people, and they believed that they had to work to make government work for people, in the same way I learned from my parents, that they made government work for their community. My parents didn’t write a crime bill or a health care bill. They helped people who came to our kitchen table with a problem that they had. And what I learned is that you can make government work for people. The social safety net has worked for people. It has lifted millions and millions of people out of poverty. Before there was Medicaid [to pay for nursing home care], if you couldn’t take care of your parents, they would be taken to the poorhouse. Is that what we are going to do again? Some families can take their mothers and fathers in, you know my mother lives with me. Some families can’t do it. You write about a loss of faith in government, why do you think that happened? I think that when people look at Washington, they say, ‘What are you doing for me today?’ The biggest economic problem we have today is that people are working jobs and they don’t have enough to live on. And if that’s the case, they are struggling. They can’t send their kids to school. They tell them, ‘I’m sorry, as smart as you are, we can’t afford to do it.’ They don’t have health care; they never take a vacation; they are afraid they are never going to be able to retire. Their view is that we don’t understand the nature of their struggle. When they look to Washington, they don’t see any relief for themselves and for their families. And that has created a loss of faith in government. No. I do not plan to retire.